This mat is so cheery & bright that we thought it would make a great gift for your friends this Christmas! This mat is as functional as it is cute. We love this mat dearly and hope it brightens up your sewing room as much as it has ours! I would love for Santa to leave this cutting mat in my stocking because my mat is old and rather warped. It would be nice to be able to cut on a flat surface for a change. I need a new mat too, and a red one shouls brighten up my sewingroom! I’ve been wanting a red cutting mat for a while to brighten up my sewing space. What a perfect thing to win! Thanks for the chance! And Santa bring me this cutting mat. Oh my goodness a new cutting mat is on my wishlist! Mine is so old and needs to be replaced. Thanks for the chance. 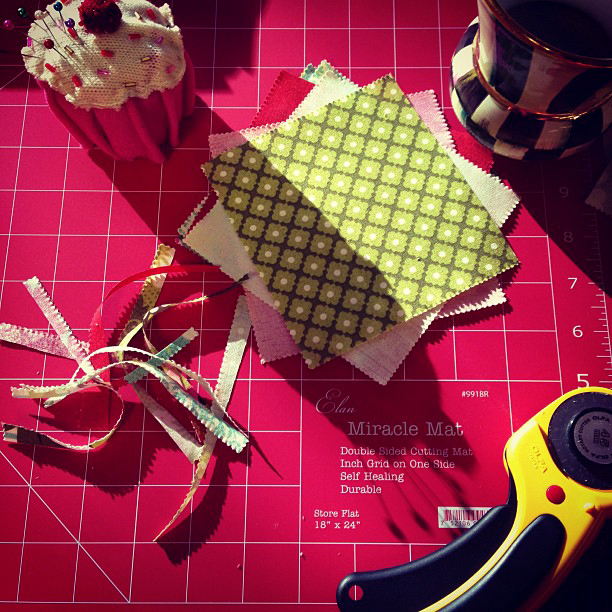 Oh, my green mat is so worn – this would really make for a bright sewing room! I need a new cutting mat (since I stepped on mine and put a big crack in it). And I would LOVE to replace it with a RED one!! OMG that is lovely! My mat is worn and I can’t cut properly on it, I really really need a new one Santa and I’ve been really good this year (honest) Thank you! I would love a pretty red cutting mat for Xmas. The lines on mine are so worn I can barely see them. This would be a wonderful gift. Out with the old and in with the NEW RED ONE! My mats have seen better days and this red one would be wonderful! I think it would be easier than the green boards to see and cut on. A girl can never have enough cutting mats and this one is so cheery. My favorite color!! My current mat is all chewed up and no longer seems to be self- healing… This would be the most useful sewing gift for me! Wow, Santa, this would be great as my mat has been overused and wasnt’ new when I got it. Plus I think the red would be easier to see when I use it. Very pretty! I’ve never seen a red cutting mat, it’s so funky.I love it. What a colorful workhorse. I could use this red mat to brighten up my cutting space. Such a pretty mat to use. It would be great to win this. Thanks for the chance. Love the red mat. That would bring a smile to my face every time I walked into my sewing area. Thanks for the great giveaways. What a fun color, very inspiring!! My unit that I have my cutting mat on top of is red! But also I have had my mat since September and already it’s been ruined by blunt blades so I could use another. The color is great and my cutting board is very very old, would be great for the new year. It would be lovely to lighten up my work table and it would look great in my tutorial pictures. Thanks for the chance to win. Would love this, to bring some cheer to my sewing space! What a pretty mat. This would add holiday cheer to my sewing room! I love the cutting mat! ooooh, I love this! I need Santa to leave me one of these as my cutting mat is completely trashed! What a great color, that would certainly brighten up my sewing! The red is awesome! Please Santa! LOVE this! I love this red cutting mat! I really need this in my stocking because it is empty! It’s about time for a new cutting mat, and it’s pretty to boot! If only I had a stocking that big! I’ve never seen a red cutting mat before. It’s so neat and new, that’s why I hope Santa brings one to me. Why do I want this cutting mat in my Christmas stocking? Because RED is my favorite color! (Santa’s, too!). This would be wonderful for my new daughter-in-law that is starting to show an interest in quilting! I already have the sewing basket wrapped! Ahhhhhhh a nice bright color for my sewing room..lol. Santa knows I need a new mat…..
Love the new mat – need a new one and red is just so bright! I need a new mat. Love the red. Oh man, red is my favorite color! I would love to have such a fun-colored mat on my cutting table. I love red! I didn’t know mats came in any other colour than green! Love this…perfect addition to my sewing room!!! Please Santa, pick me, pick me!!! I would love a red cutting mat. My green one is worn out. A red mat!! How festive!! My old one has seen much use and no longer heals itself. I have gray or green but not red. What fun! Wow a red mat would be fun to have. Red is my power color so think of the fabric that I could power cut. WHOO HOO.. I love the red color.. would fit perfectly in my sewing room decor.. not to mention mine is pretty chewed up. wow! ive never seen red! what a great sewing room color! my poor mat is beyond care…i even gave it a bath last weekend and its just so groovy! Whoever thought a mat could be a Christmas decoration! Would love to have this decorating my sewing room! Oh my gosh, I have been wanting this cutting mat for so long!! In my favorite color-RED!!! My 11 year old mat needs replacing Santa:) It has permanent grooves in it that don’t heal anymore and it’s served me well. Dearest Santa, I really need this beautiful red cutting mat. I just repainted my sewing room in turquoise and it has red accents. Can’t tell you how beautiful it would look. Not to mention, my current cutting mat is so beyond help from many years of service. I am so in need of a cutting mat–and red is my favorite color! This would be a wonderful thing to have in my stocking! this wouldn’t fit in my stocking, but it could be right under it! Thanks Santa! My old mat is so worn and that red would look fab with my Minick/simpson decor! This would be a great replacement for my current mat which recently was bent out of shape during our move. Well the red mat would go beautifully in my sewing gray sewing room. I think Santa should leave this for me because it would match the brand new Viking Tribute 140c that my hubby got me for Christmas. Then all my quilting supplies will match! Oh my goodness….this is at the top of my wish list! Love, love, LOVE the red color!!! I have a red polka dot pressing surface, so this *has* to come live next to my ironing surface, it’s just fate. This mat would make my sewing room more cheery! Thanks for the giveaway. A red mat would be a cheerful addition to my sewing room. I would love that red mat because my old mat is an ugly yellowish-green color. This one would look so much nicer under all my beautiful fabrics. I do NEED a new mat, and what could be better than red? It’s beautiful! Such a happy color, Santa Moda, hurry down the chimney to me! Dear Santa, this mat would be a welcome gift to my sewing room. My old green one is wearing out and this would be functional and oh, so cheery!! Oh, please oh please oh please!! I’m about to receive my first sewing machine for Christmas (yes, I know because my husband stinks at secret-keeping) and I have fabric just waiting to be made into a fabulous new quilt (with lots of help from my quilter of a Mom)…I haven’t purchased a cutting mat yet so I would LOVE to have this beauty to kick off my quilting fun. I love red, and could always use a second cutting mat! I love this mat! My old green one is over 20 years old and needs to be replaced. This one would sure cheer me and my little corner of the room sewing area! I need a new mat. Mom bought mine in 1995. I think it’s ready to retire. My studio is red and white and this would just be the icing on the cake. Cutting mat in red is so pretty~! I need a cutting mat please! I’d love Father Christmas to bring me a cheery red cutting mat as it would brighten up my sewing room! My mat is so old I don’t even remember when I bought it. A new red one would be wonderful to start a new year of projects! Wow! I love this mat! It’s so cheerful and fun. What a great change from the same ol’ green mat. Love it! I love it! It would be so nice to have a brand new mat in my favorite color! Love it!!! So much prettier than our standard Green ones!!! My mats are pretty small. This one would be a perfect addition to my sewing room! I would love it if Santa could leave this mat under my tree because I really need a new one. I’ve been so good. I’d love for Santa to leave this in my stocking. Thanks! Red! I love this and just moved into a new house and finally have my own sewing room….this would be the most awesome housewarming gift e.v.e.r.! Red…my favorite color! Would love this beautiful mat!!! Would love a new mate in a bright color. I desperately need a new cutting mat for the new year so that I can design lots of new sewing patterns! This one is just soooo pretty! That’s hot! I would love this and give Santa extra cookies in return. A new mat is always needed! Thanks for a chance to win this red beauty! WOuld love a bright NEW mat! THanks for the giveaway! What a cheery mat…I just left my travel size mat somewhere. I travel with my husband. Santa, I could really use a new one. I promise I’ll take care of it. What a fun Mat It woud look so nice in my sewing room. Love the color of this mat! I sure hope Santa puts this in my stocking because I love red and I NEED a new mat! This would be awesome in my new studio (which we’ll be starting on in January — converting attached garage into a studio. I’m so looking forward to it! I want Santa to bring me this fabulous red mat because I’ve been a good quilter all year…I promise. This would look lovely living in my aqua room with this splash of red..and the one I have is a bit tired and collecting a lot of fuzzies…thank you for the opportunity to win this red mat. What fun! I love that cheery (cherry) red. Perfect for using on dreary cloudy cold winter days. More spaces to cut means more sewing to do! I neeeeeeed this fabulous red mat to complement my newly remodeled sewing room!! I have been quilting like a foolio for Christmas this year and my mat is looking a little sad. This one would be awesome! Thanks! Merry Christmas! I need this lovely mat for my projects…it is my favorite color. Merry Christmas! I need this lovely mat for all of my little projects…it is my favorite color! I have two old mats taped together in my sewing room. I’d love to add the right size to the mix, and redder is better! Oooooh, it’s RED! I live in a bright RED HOUSE, really. My quilting room is in my drab, dreary basement. This pop of color would really brighten up that poor old room! Thanks, Santa! My quilting and embroidery room is in desperate need of a make-over. It used to be our sons bedroom when he lived at home. It is so dark with beige and black. This lovely red mat would be the perfect inspiration to jump start a redesign of the room and decorate for ME! It is so nice to see a mat in such a lively color. Love the color! I have an 18×24 mat on my Christmas list as the first one I ever bought is ready to be retired. It has served well through many, many quilts. OOOOOHHHHH, I have never seen a mat like this one. I would like to have the feeling of Christmas the whole year. I think this cutting mat can do that, so I hope I’ll win. What a cute cutting mat! That would look terrific in my sewing room and would get a good workout too. Great idea! Just LOVE the RED !! It’s RED, I love RED! How pretty and thanks for a chance to win it! Santa- Red is my favorite color and you know how old my mats are! I could really use and appreciate new red ones. WOW! My goal for the coming year is to get out of my comfortable quilting box and delve into new things, try new bold color combinations, tackle that feathered star. What a great daily reminder a brightly colored cutting mat would be as it sat in it’s place on my sewing table encouraging me to see things a new way. I love red and a red cutting mat would be so much easier to find under a pile of fabric. LOVING THE RED! Who says cutting mats have to be green? HELP!! My mat is warped…and red is such a pretty colour!! I would LOVE to win this mat!! Thanks so much for the chance! Looks so bright and cheery, sure would brighten up my sewing room! Red…my favorite color! I absolutely LOVE the red mat! Thanks for doing the giveaway. I’m crossing my fingers here! I would love a new “red” mat. Please Santa!! The color is so wonderful. My cutting table is dark green and with the current green mat, it is sometimes hard to know where you are cutting and when to stop! The red would look great, save rotary blades and the top of the cutting table, too. I would love to win a new cutting mat and I love it’s cheery color! I’ve been lusting after one of the 24 x 36 red cutting mats for awhile. It would looke so much better in my red & yellow sewing room than the green one. Sandi really needs a cute red cutting mat.She really needs to toss the old green one away but she keeps hanging on to it. So, please help her. Thank you for the chance to win. Gotta love cutting mats. Wow — red cutting mat would be awesome!!! It’s a Miracle Mat and I need miracles to get ALL the projects I have to do done! Every sewing project needs some cutting. with this board the cutting will be fun and fast. Gotta sew, sew and sew! Dear Santa – I would love to have a new cutting mat for Christmas. This red one would be just perfect for me. I have tried really hard to be a good girl all year. Sometimes it has been difficult, but I think I did it. I will leave you milk and cookies on the table. Thank you very much Santa. It’s RED. It doesn’t need another reason for me to love it. 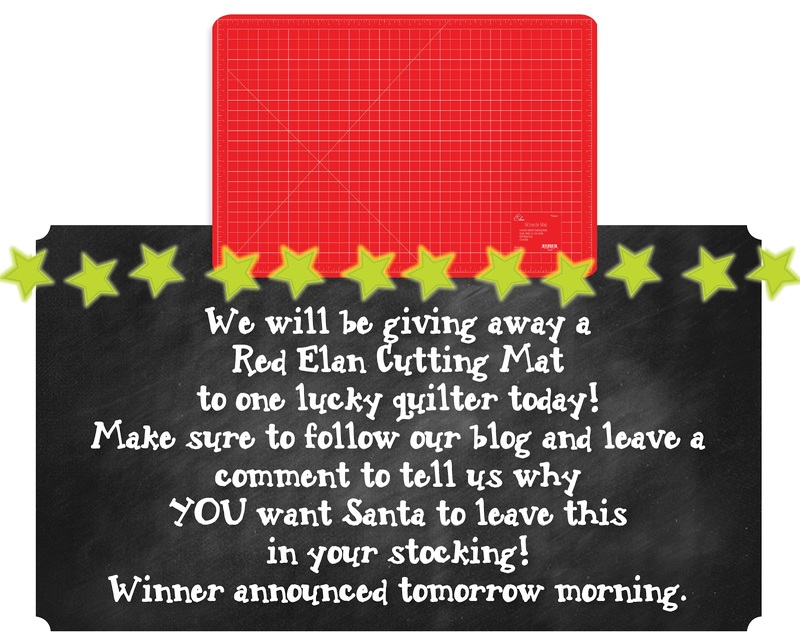 I would love to replace my worn out mat with a sparkly new red mat!Thanks for the chance to win! Red IS my favorite color. It would make any space look good for quilting. It is just so sweet and Christmasy, please Santa, I’ve been really good! A new red mat would fit right in to my red and white colored schemed sewing room I’m working to achieve! Oh how pretty!! Santa knows RED is my favorite color and this will look great in my sewing room. 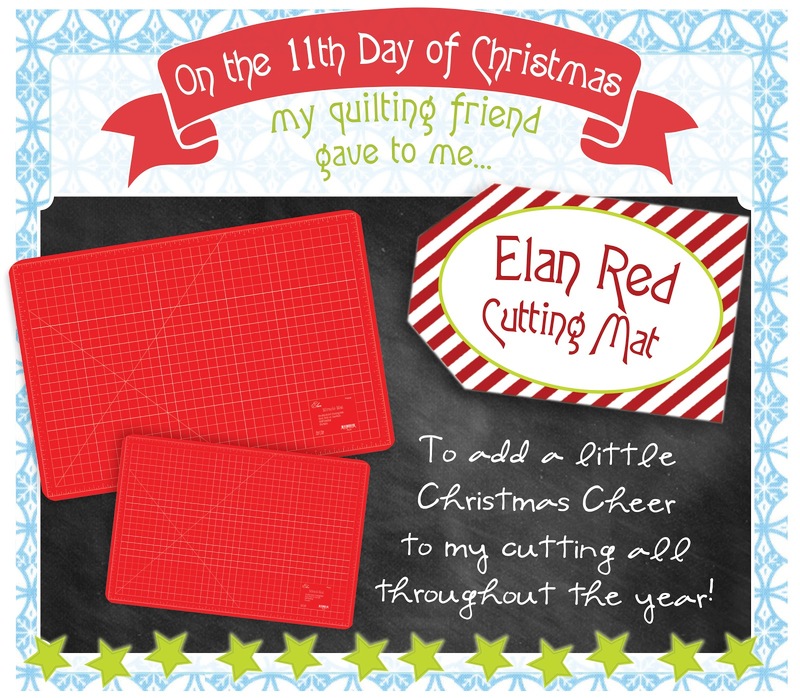 Elan is the ONLY cutting mat brand I use! They are the best!! Because I’ve been really nice?! Red is my favorite color and I need a new mat. I have never used Elan mats before so this will be special. Looking at my worn mat and thinking I need a new one. The red would so much easier to see and brighten my sewing room. A red cutting mat would be a nice addition to my sewing room. And my mats are getting worn so a new one would be great. That’s my absolute favorite color – it would fit right in my sewing room! I recently moved, and in getting my new sewing room put in order, I discovered that my olfa mat did not fare well and had to bid it a fond farewell. Projects that I enjoyed so much are now “back burnered” because they take so much longer without a mat. If Santa were to bring me a new mat this Christmas in my favorite color, RED!, I could joyfully return to my favorite creative outlet. Thank you, and Merry Christmas! This would be wonderful in my sewing room. I bought a very large cutting mat not realizing that I can’t turn it around when I need to so now I need a smaller one. This red one would be great and pretty too. HELP SANTA! MY CUTTING MAT HAS SEEN BETTER DAYS! THIS WOULD BE NEAT IN MY STOCKING! MY poor green cutting mats are getting a bit beyond self heal, so this bright cheerful one would be a wonderful addition to my sewing room. Red would add so much to the design of my sewing space.It would just brighten up the whole room!! Plus the light from my smile seeing it in my stocking would be tremendous!! My old green cutting board is 15 years old! How about a new bright red one to cheer up my sewing room! This is beautiful! I could use a new mat to brighten up my room! I have been teaching my friends at church to quilt and this mat would be great because some of my friends bought little tiny ones and I could share this one with them! My please Santa, I need a new cutting board, mine is about worn out. It is beautiful, bright and shiney red. I realized the other day that almost every quilt I make has a little red in it somewhere! So this red cutting mat would be perfect to add to my sewing room. Thanks for the chance! Oh this is all me, my sewing loft beams & bathroom are this color. It will fit in perfectly. Please pick me, I need a new one so badly. I have drooled over that mat since the very first time I ever saw one…amazing! A red mat would be wonderful for cutting those fabrics that seem to blend too easily with green mats. Great giveaway! This would look so much better than my old gray mat! This mat would make me smile every time I had to cut fabric -plus it fits in with my ‘studio decor’. Fabulous color, self-healing and reversible! what more could anyone ask for in a mat, I love the red! thanks! A bright new mat would brighten up my sewing room! That would entice me to start next year’s Christmas sewing much earlier! I am just starting out so I need all the supplies I can get. I love the color too! This would be a great replacement to my smelly green mat! OOOH OOOH OOOH red…I’m so excited…it’s beautiful! I can see the beautiful things I’ll do with this! Love, love, LOVE the RED!!! This mat would look perfect in my sewing room–so cheerful! I need a new cutting mat! Mine is a foldable one and is falling apart! I would love a new one! My old mat is warped in the corner from getting my iron too close to it one time. I’d LOVE to have a new mat to cut on. It would be a blessing to win. Thankyou for the opportunity. God bless! Merry Christmas! so beautiful. my poor ol mat is warped and barely gettin by these days. thanks for the chance. My mat has seen better days, and this one is just so cheerfull! I would love this, because I don’t have my own. My dad has kindly leant me his and it is all covered in very strong glue which I can’t get off! Because this mat is beautiful…. we all love beautiful things……..
this is my favorite color and I really need to replace my current cutting mat. it would sure add a bit of color to my sewing area. Oooooh, red. Love the color! It would look so pretty in my sewing room, sigh…. Can it come and play? Lol! A perfect mat on which to cut my Moda fabrics! Can you tell I would give this mat a good home?! Oh my I love the color and my mat is so warn I really need this. Thanks for letting me put my name in for the drawing. I am a follower. Its so nice & red is my favorite color! I have never seen a red cutting mat, I really really love it! There are two reasons why I would like one of these. 1: I would like a cutting mat downstairs, so I can do some cutting while children are asleep. 2: my current mat is pretty scored. 3: This one is bright red. Oh hang on that’s three reasons. I need a new one!! And that would be so nice to add to my collection of quilting supplies! That is one gorgeous cutting mat. Absolutely love the red! hum…a cutting mat in my favorite color! Must be my Christmas present this year! Thank you for the chance to win it! That red is so cool!!! I love red and why didn’t they come out with red sooner!!! My reason for wanting one is simple…IT’S RED!!! Enough said! I want to win because this would look SO much better in my sewing area than my ugly blue one. I’ve never seen these before! Love the colour. Oh would I love this – my old mat is truly an eyesore! Wow, Red is my favorite color!!! One of these would really go great with my other Scarlet and Gray items!! I hope Santa is generous!! OMG! I need a new cutting mat sooo bad! This pretty red mat would be wonderful! Well I love red…..in any shape or form. This mat would brighten my sewing room. I recently took over one of the bedrooms as my sewing room. This mat would be a perfect fit. Thanks for the chance to win this fabulous prize. I need a new cutting mat and one that’s functional and attractive is doubly good. Oh, my! This would look so great in my sewing room. What a great Christmas surprise! So cute! It would look awesome in my new yellow sewing and quilting room!!! What a great color for a cutting mat. I think it would bring even more cheer to cutting fabrics with this bright addition to my supplies. Wow…..Love the color. It’s always great to have an extra cutting mat (which I don’t). Please Santa. my cutting mat is years old … would love to replace it with a red mat! thanx for the chance to do so. Oh how this lovely red mat would cheer up any sewing studio!! I need a new cutting mat because my other one quit healing.. LOL.. I totally need a larger mat as I’m a new quilter and haven’t plunked down the cash for a large one yet. I wanted to get the Breast Cancer Awareness one (I’m a 2+ year survivor still in treatment) but I guess they were only available for a short time. I like to be different, and RED definitely is that – not green or yellow! It’d be so fun to make Christmas (and soon, Valentine’s Day) gifts using it – such inspiration! I would keep the small one to replace my worn one, and donate the bigger to the 4-H Sew and Quilt day. Love the RED!! very festive!! although I would love to win it looks like my chances are slim,so to whomever wins enjoy!! What a fun cutting mat how could anyone be sad while using this mat it will definitely chase away the winter blues! 1) I need a new cutting mat – mine is a little small. You can never have too many cutting boards & this one is just too pretty!! I’ve cut through my old one! I follow the blog, I’m a quilter and my favorite color is red; are those enough reasons Santa to bring me the cutting mat? I would love a new red cutting mat, mine is old an worn out….thanks for the fabulous giveaways!! I would love to have this bright and cheerful cutting mat to spruce up my craft room! That’s pretty! I would like that because…it’s pretty!!!! Oh how I would LOVE to have this in my stocking for Christmas, it’s so cheerie looking and would help make me happy happy happy while I cut fabric. I’m so glad my friend Denise sent me to this blog. I signed up and have some catching up to do. I haven’t learned all about haveing these feeds sent to my email so I have quite a few to read through. I can see I missed a lot but I’ll have great fun!! Dear Santa, Please leave me a pretty red cutting mat in my stocking, and I promise to finish cleaning up and organizing my sewing studio so I can show it off to all my quilty friends! Holly Berry red would look so good in my sewing room! The mat I use now is a little warped, so this would be a perfect replacement, and more fun to use than green. Thanks. Dear Santa: Please bring me that Red mat. It will look like Christmas year-around with Green and Red cutting mats in my sewing room. I need a new mat, plus this matches my sewing room perfectly!!! One can never have too many cutting mats! And I love the red. Please, Santa, please! I have been needing a mat this size & i love the red color!! Red is my favorite color! It would really make my sewing room look festive. It would also look beautiful under my tree, even with out wrapping paper. Oh, what a pretty cutting mat. I would love Santa to bring me one because mine is old is not as cheery as the red one. Awesome cutting mat!! Reasons Santa would find a deserving owner in me…I used mine as an ironing board one evening when I was *very* tired. Also love that it’s red!! Oooohhhh I hope Santa stops by to see me with this pretty new red mat! It would be nice to have a new matt that is so pretty. I have had the same mat for 8 years and it’s covered in duct tape so the fabric sticks to it when I use the iron (Funny I know).This is so pretty I love red. Happy Holidays to everyone. Ho Ho Ho – I love red and I so need a new cutting mat! Love your site, blog and patterns! I would want Santa to bring me this mat, because I can never seem to have enough cutting mats. I would like to have every surface space in my studio covered with them. I would love to have a new, nice, smooth, fresh, RED cutting mat. How cheerful! oh Santa, I really need a new cutting mat and this one looks perfect! Thank You and Happy Holidays! Santa, I promise I’ve been a very good girl. This would be a just for mommy present. I don’t get many of those!! I’d love this cutting mat. The color would help it not to get lost in my sewing room. I need a new mat, and this red one would be perfect! Red is my favorite color!! My green cutting mat has had a hard life. A red one would be the perfect replacement – functional and pretty! Thanks for the chance to win. I’ve had the same mat for so many years. I need a new bright cheery one!! Oh, Santa!!!! Please bring me a red cutting mat because 1) Red IS my color 2) Red is my FAVORITE color 3) Red is the theme of my SEWING room 4) RED is the color of CHRISTMAS 5) I *NEED* a red mat in my sewing room!! I just LOVE that mat! I have never seen a red one!!! Red!!! Oh my, red’s the perfect color for a cutting mat at Christmas. But, dear Santa, I’d use this mat all year long. Oh Santa… I have been good! Santa-baby, I would love this cheerful cutting mat! It’s red – need I say more? I learned how to quilt because someone took the time to teach me. Now my daughter knows how to quilt and I hope it will pass down for each generation. I now invite anyone who is willing to learn into my home to learn to quilt. I share all my cutting tools, rulers, and sewing machine. I hope to make an impact on them the way my friend did with me. A new (very pretty) RED mat will be put to good use in my sewing room by these new quilters. Thank you for considering me as a new home for the mat. I know it will be used often. A new cutting mat would be awesome. Mine is getting so beaten up. I need to replace it. I’m not sure how old my cutting mat is but it has been with me a very long time. I would sure be happy with Santa if he brought this to me! I just had a baby and moved this year and I don’t know where my cutting mat is. I also love the color! I love the colour of these mats. Nice and cheery. I’d love to find one in my Christmas stocking. Dear Santa, I would love to get this cutting mat, it would go perfectly in my sewing room, my colors are all primary colors. Santa, I could really use this cutting mat. At this time I do not have one. It would help me so much with the projects I have in line to make. Red’s my favorite color. Would look great in my new sewing room!!!! Ooh what a beautiful red – it could replace my old one that is looking a bit tired. Oh, it would go so nicely with my pink mat . . . I’d have breast cancer and women’s heart health reminders in my quilting area!! So pretty!! Oh I love this red mat!!! Dear Santa: this cutting mat would be like a decoration under my tree. I desperately need a new mat! Please, Santa?? I know just the person who I can share this with … my mother and quilting mentor extroidnare. Loving this mat. Red is my favorite colour, I have everything in red except my green cutting mat! This would be a dream to have. Thank you. I love the red! It would definitely brighten up my sewing room. Thanks! I love it, just the color I would want and it will looking very good by the red wall in my livingroom. Only have one very small cutting mat so another mat would be wonderful especially a red one. RED!!! I collect red, Santa knows this, Santa brings me something red every year! Most of my kitchen untensils & appliances are red … I need more red in my sewing space! Wow this is the most Christmas’y mat I have ever seen. Could surely use one to brighten up my holiday sewing. Love the bright color! ♥ It would match my blue/red sewing loft theme and would certainly see a LOT of use! Thanks for the giveaway! I’d like to win this because mine is gettting pretty worn. I’d love a fresh new one. Plus it is red. Love! Because my dog ate one of my cutting mats… And I am so not kidding on that one. All I want from Santa is a red cutting mat for my red & white sewing room. I love red and have from a good source that Santa does too. 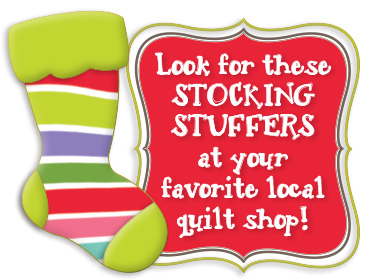 He must have them all at the North Pole because I have never seen them at my local quilt shops. My green one has seen better days for sure. I asked Santa for a new cutting mat this year but hadn’t seen such a pretty red one! that would look amazing on my cutting table! A new red mat…what a treat for me! Thanks for sharing! Wow! Red! That would make rotary cutting even more fun. Thanks for the chance to win. LOVE the red…..and my green one is just about shot! Wow… what a gorgeous color mat. Oh my a red mat! I would love that! It is unique and I love unique! Santa please! PLEASE! This red mat would be the perfect size to take to retreats and sew-ins. It would really stand out! I love the cutting mat because it is red. I’ve never seen one before and because I really need a new one. Love the color!!! What that would do to brighten my sewing room. I am seeing red! Love it. This would be welcome to my table.I need to replace my old one.dear Santa,put this cute mat in my stocking!! I can only imagine what it would be like to use something modern like a cutting mat! And a red one to boot. Because red is my favorite color! I love that mat! Well, it is pretty and I like pretty things. I am in real need of a new cutting mat, mine has grooves worn into it in several places. Pretty! I would love one because I have my sewing things set up in the middle of the family room for all visitors to see, so it would be perfect to have it match my pink, red, and aqua decor! So I don’t have to share !!!!! My daughter can use the old one and I can enjoy a brand new beautifully christmasy red one. My best mat warped in the heat this summer, and I sure could use a new one. A bright red one for example. Wheeee! I love the red! And I do need a new mat as mine is so worn. I’ve got my fingered crossed. Lovely! My old mat can’t even self-heal anymore it’s so old! This would be a special cheerful addition to my household! I need a new cutting mat for my new worktable. This is the first red mat I’ve seen – very pretty. I would love this cutting mat because my mat is all beat up! and it is not nearly as cheery as this one! This is a gorgeous mat. I just happen to be wearing a matching red sweater right now, so I’d be coordinating. I love this red mat! It definitely needs to come to my home. I haven’t ever seen a red cutting mat so I feel that it is a necessity. I would love this cutting mat. Love the red! It would be nice to work off a mat that wasn’t green or blue! I would like Santa to bring me a red Elan cutting mat because mine is getting bad (about 20 years old) and I am so tired of green. Oh, my old mat is a dull green and so battered and used. This red one would be perfect in my sewing area. Love love the red mat and it would be super for my eyes which are fading with old age,also re is my favorite color. I am a follower of your blog. Red is my favorite color and it looks like I could see my fabric better with this color. LOVE LOVE LOVE that color – just happens to be my favorite color!! What a great Christmas gift to me that would make!! Oh gosh, I’d love a pretty new red cutting mat since the one I’ve been using for the last ten years is dull gray and REALLY ratty! I would love Santa to give me this gift because my current cutting map is all warped! I love the red cutting mat. It would really brighten up my sewing area! I broke my mom’s cutting mat, so I think it’s time I gave her a new one. This one would look great in her sewing room! Red is one of my favorite colors and my 23×36 mat is wearing out. I am a follower. That cutting mat does look bright and cheery. I can’t remember when I bought my cutting mat! So guess it is time for another one. I love love this red mat! Have to have it for my sewing room. oh what a pretty mat, makes me want to go cut something up. please pick me please! Hi!!! Great giveaway!!! I need the larger size!! Mine is smaller and I love the red!!! Thanks for the fun!!! What a real pop of color! My sewing area is in the family room and this would surely brighten things up! I want it–just because it is red! My old one is getting pretty bad~ I would love a new RED cutting mat! I love red! Thanks for the chance! What a fun addition to my sewing room the red mat would make. It would really put me in a cheery mood even if my project wasn’t turning out so well. I’d love a new mat. Mine is getting pretty worn and I’d love to have a quality one. Thanks for the chance to enter! what a happy color! it would look perfect in my red and white sewing room! I LOVE the red!! What a great color to be under the tree. Maybe the DH & kids won’t realize it’s a new mat and it would stay nice, as my current one is trashed and has super glue on it??? Oh, I really need a big mat! And I love the red. I would love for Santa to put one of these in my stocking ’cause my old one is very worn out. Poor old thing is missing the markings over most of it already. I would absolutely love Santa to sneak this under my tree! I currently have a very small cutting mat and could only imagine how much easier it would be to cut up my fabric on a bigger mat! I would love that mat as my old one has warped slightly and is losing surface in a few places. Oh, so pretty! I would love to have this mat! Thanks! What a perfect gift from Santa! A red cutting mat!! I love it! Anyone would love to win this who uses a rotary cutter. This mat would be perfect for my stocking as red has always been my very most favorite color. It is so dashing and looks good with everything. My dull, gray mat is old and tired and it is time it was retired. Thanks! A RED cutting mat???!! Since my favorite color to use is green, I sometimes have trouble with my current one. Red would be a great gift! My cutting mat is looking pretty worn so I would love to have a shiny new one! I love red! Thanks for the chance! Yes, please a lovely bright cutting mat and of course i am a follower. Thank you. The red is so cheery and, well, Christmas-y. That would make it a “Merry” nice gift! Thanks for a chance to be gifted. Would love this bright red mat in my stocking. Mine is very worn. I need a new cutting mat! And this one is such a pretty color. I need a new mat since my old one has about had it, and a red one would be just perfect for my sewing room! I LOVE it!! No more boring green cutting mat. I wish Santa would leave this for me in my stocking so that it would match my kitchen which has become my cutting and sewing area. Santa, you know this would make an awesome gift for my daughter who is just learning how to quilt! I sooo need a new mat! Mine is warped. I think I accidently tried to iron on it and a delrious state years ago…. oops! This is the THIRD time I’ve tried to post a comment to this blog to enter this give away. I have no idea if this never shows up why or what to do so it will show up. Why can’t you just put the comments/contest on Facebook where comments are easy to enter without all this extra stuff and it’s EASIER TO DO! I would really like to win this, RED would be great to see instead of green, I’m new to learning to quilt so it would be great to have a mat like this one! RED is my favorite color and what better way to brighten up my sewing area? You know my favorite color is RED! Please put this mat under my tree!. I know it will inspire me to make beautiful gifts for others! Thanks! I am a follower & I reeeeeally need a new cutting mat – mine is sooooo cracked. I know it won’t fit in my stocking but if I win, it will be hard to miss it – love that red. Thanks for the chance & Merry Christmas. Elan mats are my favorite. I have 2 that are 8 years old. Nowhere near to get a new one. Red is my color for accent in my house. Elan mats are my favorite. Unfortunately there is nothing close to me to be able to replace my 8 year old one. Still going strong with the one I have, but would love a new one. I’d like santa to leave anything sewing related in my stocking, oh and this red mat would be a perfect gift under the tree! I would love this new red cutting mat because I frequently host sewing bees for breast cancer prjects. Each time it is a new project and new recipient. We never have enough cutting mats because we never know how many people will join us to help and if they can’t sew we have them cut and iron! I would love this mat so that it can be shared by many many women to help others!